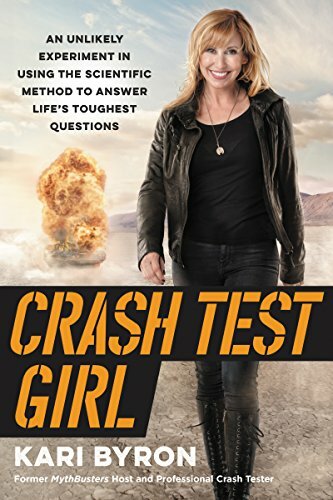 Kari Byron—former host of the wildly popular, iconic cult classic MythBusters—shows how to crash test your way through life, no lab coat required. Kari Byron’s story hasn’t been a straight line. She started out as a broke artist living in San Francisco, writing poems on a crowded bus on the way to one of her three jobs. Many curve balls, unexpected twists, and yes, literal and figurative explosions later, and she’s one of the world’s most respected women in science entertainment, blowing stuff up on national television and getting paid for it! In Crash Test Girl, Kari reveals her fascinating life story on the set of MythBustersand beyond. With her signature gusto and roll-up-your-sleeves enthusiasm, she invites readers behind the duct tape and the dynamite, to the unlikely friendships and low-budget sets that turned a crazy idea into a famously inventive show with a rabid fanbase. Crash Test Girlreminds us that science is for everyone, as long as you’re willing to strap in, put on your safety goggles, hit a few walls, and learn from the results. Using a combination of methodical experimentation and unconventional creativity, you’ll come to the most important conclusion of all: In life, sometimes you crash and burn, but you can always crash and learn.